Dal – We know that dal is a staple for millions of people across the world, giving daily and often much needed all-round nourishment, but dal is also a fundamental symbol of the culture of a community (it is a cultural touchstone) and as such it is with pride and affection that dal dishes are placed at the centre of a table of food (not as a side-dish) and recipes lovingly handed down to generations. 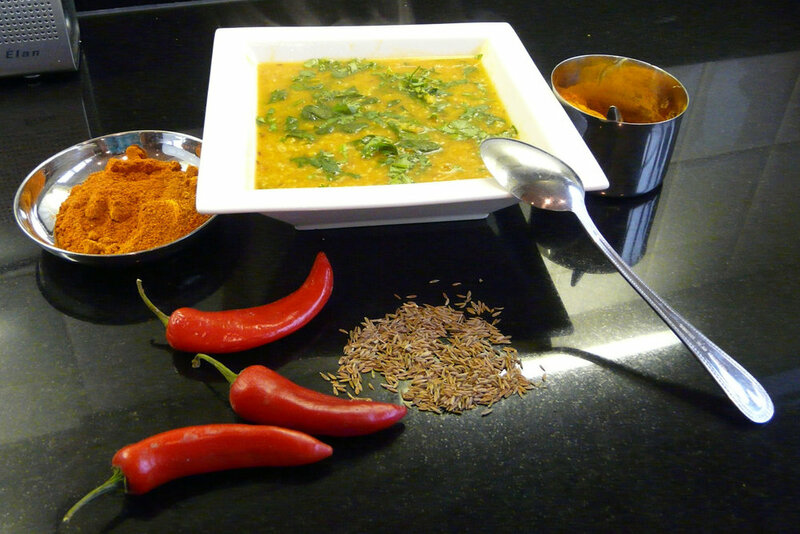 Dal is a feature at feasts, holy days, happy and sad occasions. It is my go-to ingredient when I want, taste, comfort and good, healthy food and a connection back to my heritage and it’s what I love to spend time cooking for my son and family. This is my mum’s recipe – Chana daal is a ‘meaty’ daal with a wonderful texture which we would look forward to eating as a family. It is a traditional North Indian dish and provides vitamins, protein and iron. Importantly, this dish provides a double hit of turmeric as it is added to the daal when boiling and to the a sauce. Turmeric is a true power spice packed with antioxidants and helping to ease inflammation. Every day new research findings are showing the positive health effects of turmeric. This recipe also includes chili, ground coriander and cumin – all wonderful health-giving spices, so each mouthful will not only taste delightful but also fuel you with goodness.